A rare picture of Chancellor Kaine's notable electoral defeat in late 1985. For unknown reasons Kaine tried to hoax the Shakespeare vote by purporting to possess an original copy of 'Cardenio' . For reasons never fully explained, Kaine did not supply the necessary proof and was not heard of for nearly six months. 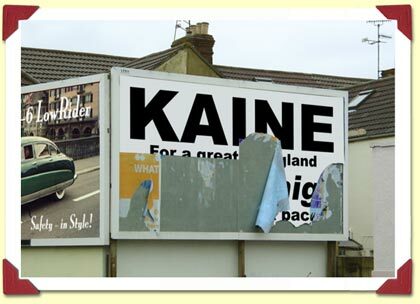 Poster orignally read: 'Kaine - for a better England. Vote Whig and never look back'. Note advert for 'Griffin-6 Lowrider' automobile to the left; in 1985 the Welsh-built Griffin was a very popular car indeed. - Author's collection.